I starterd writing the Silver Tears Series because I wanted a story to, in a way, follow the "Bad" guy (girl) and not have that character be held back by moral or emotional constraints. I hope that those who read the series enjoy it as much as I enjoy writing it. 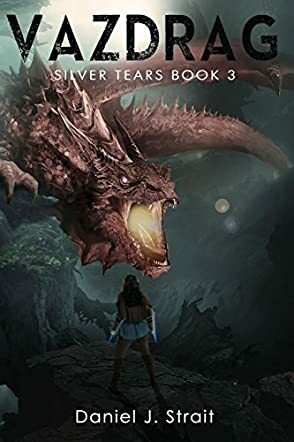 Vazdrag: Silver Tears Book 3 by Daniel J Strait will take you on an epic fantasy journey through the author's created worlds. This is the third book in a series that ultimately aims to discover and unite the five members of an ancient and mythical prophecy. In Vazdrag, three of the members of the prophecy are together; Nakiata (A Shadow of Thought – ‘SOT’ Master), Dravone (A Morphan – similar to a werewolf) and Ka’tia, their latest addition who is a Warrior Princess from Zondura. Together the trio seeks the next member of the prophecy by entering “Black Doors”, which will take them to other worlds and galaxies. This particular Black Door on Zondura, however, has the trio lost and seemingly travelling in circles. Eventually, though, they emerge and will form alliances with various creatures, offering help in exchange for further information about the Prophecy. Daniel J Strait has taken considerable time and effort in this series in creating worlds and creatures that are unique to him as a writer and I would congratulate him for that. The read is interesting and exciting at times as the trio battles to overcome the obstacles, deceptions and warlike characters placed in their way on this journey. The latent sexual tension between the two female characters (Nakiata and Ka’tia) and the single male, Dravone, was palpable and at times riveting. For me, this was one of the highlights of the writing, since, for me, character often trumps adventure. For lovers of the genre, however, there is plenty of action, along with great character development. Vazdrag: Silver Tears Book 3 is a good, solid read and any fan of epic fantasy is bound to enjoy it. I’m sure, like all good series, reading from the start is desirable, but this can be read as a standalone. I am intrigued enough to wonder how Book 4 will develop as the team looks for the next member of this prophecy. It’s a recommended read.